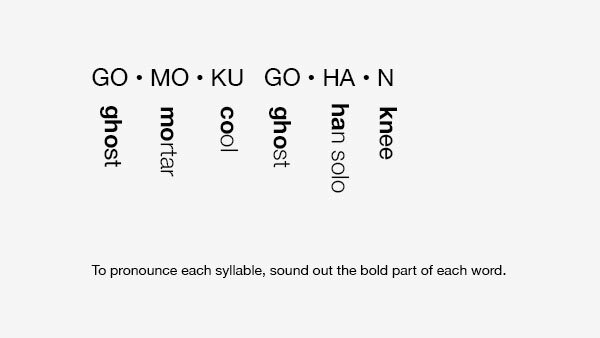 Gomoku Gohan, which literally means “five item rice” is the Japanese equivalent of pilaf. As the name implies it involves rice cooked with five other things. 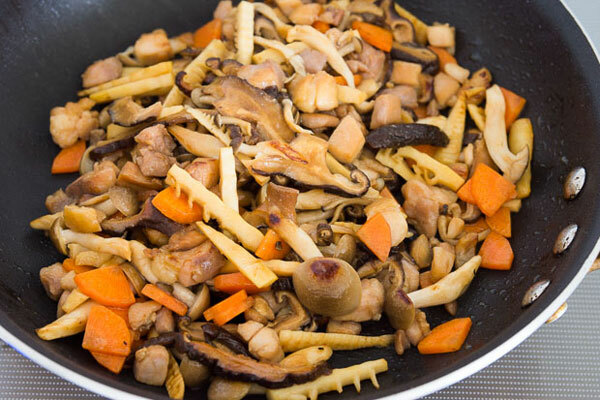 What those are, depends largely on the household, but typical additions include, fried tofu, chicken, fish, bamboo, carrots, mushrooms, lotus root, burdock, konnyaku, fishcake, and edamame. But really you can get a little creative and include any combination of ingredients that are going to create a great stock with contrasting textures. As you might expect from a rice eating culture, there are dozens of rice dishes where rice is cooked with another ingredient for flavor, but gomoku gohan is probably the most famous of them all. It’s simple both in concept and in execution and relies on ingredients that are loaded with umami to create a broth in which the rice cooks. This time, I used chicken, bamboo, carrots, shimeji and shiitake mushrooms, but like most Japanese katei ryouri (home cooking), it’s all about what’s seasonal and in your fridge at the time. I like to marinate the protein to impart additional flavor before stir-frying it with the veggies. This gets some Maillard action going on and the resulting fond imbues each grain of rice its concentrated flavor as they plump up. I used 50% milled brown rice for this. It’s great because it retains the rice germ (which contains most of the nutrients in a grain of rice) and some of the bran, but with about half of the bran polished off, it cooks and tastes more like white rice. If you end up using full brown rice, you’ll need to increase the amount of water and the cooking time accordingly. 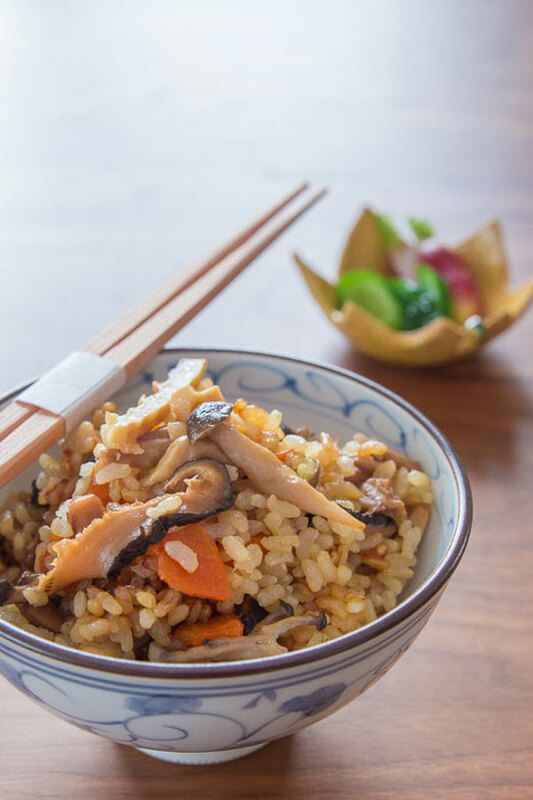 Gomoku Gohan is a rice dish featuring a flavorful broth and seasonal ingredients. It is the Japanese version of rice pilaf. Wipe the shiitake mushrooms with a damp paper towel and then soak them in 2 cups of boiling water for at least 30 minutes. Trim any excess fat or skin of the chicken thigh, leaving some behind (fat = flavor). 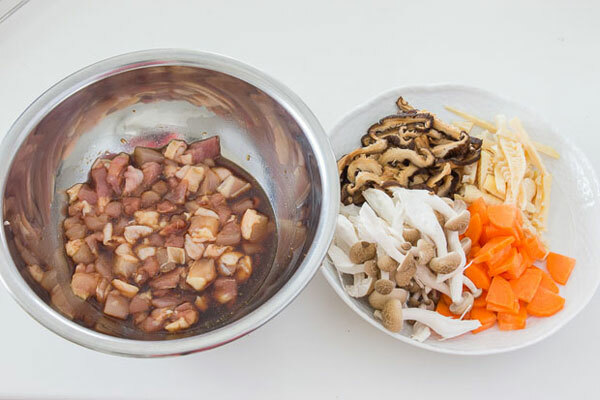 Cut the chicken into 1/3-inch (1cm) cubes mix together with the soy sauce and mirin. Let this marinate for at least 20 minutes. Put the rice into a fine mesh sieve and wash with your hand until the water runs clear. Let the rice drain well and then put it in a heavy bottomed pot with a tight fitting lid such as a dutch oven. 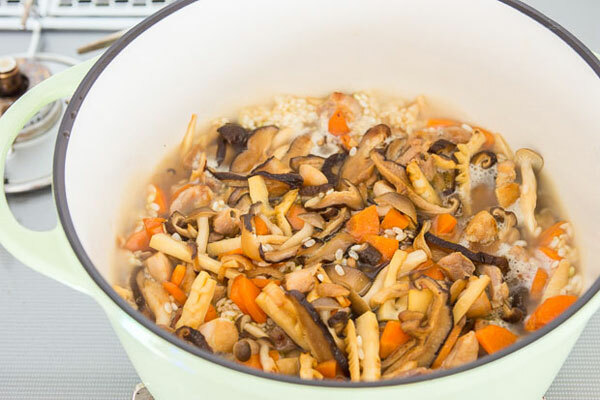 Add 1 3/4 cups of the soaking liquid from the shiitake mushrooms to the rice, and let this soak while you prepare the other vegetables (if you are using brown rice, you'll want to soak the rice for at least 1 hour). Heat a sauté pan until hot and then add the oil. Keeping the marinade in the bowl, add the chicken into the hot pan in a single layer. Fry until well browned on one side, and then stir-fry. Add the vegetables along with the remaining marinade and fry, string periodically until the vegetables are browned and there is no liquid left. Dump the vegetables and chicken over the rice, but do not stir (if you mix it together the rice will not cook evenly). Bring the pot to a boil over high heat. Cover with a lid and turn the heat down to medium low and set the timer for 15 minutes. Do not open the lid while the rice is cooking or steaming. Turn off the heat and without opening the lid, let the rice steam for 10-15 minutes. When the rice is done steaming, mix it all together using a rice paddle and serve, garnished with minced scallions. 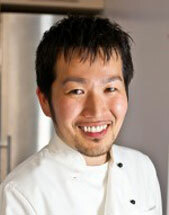 Marc Matsumoto is a culinary consultant and recipe repairman who shares his passion for good food through his website norecipes.com. For Marc, food is a life long journey of exploration, discovery and experimentation and he shares his escapades through his blog in the hopes that he inspires others to find their own culinary adventures. Marc’s been featured in the New York Times, Wall Street Journal, and USA Today, and has made multiple appearances on NPR and the Food Network.